Die bisherige FIS-Control-Updater App läuft unter Android 6 nicht mehr. Daher arbeite ich an einer neuen Version. Es fehlen hauptsächlich noch kosmetische Sachen, z.B. sowas wie ein Fortschrittsbalken. Aber das Aufspielen der Firmware geht damit schon. Änderung im Vergleich zur alten App ist, dass man die Firmware-Datei separat auf sein Handy laden muss. Und es muss ein Dateimanager (z.B. Total Commander) auf dem Handy installiert sein. 3. App starten und entweder oben rechts im Menü oder mit der Menütaste "Connect" auswählen. Dann das "FIS-Control" auswählen. The current updater app has some problem with Android 6. I am working on a new version. Some things are still missing, like a progress bar. But the firmware update already works. There is a change compared to the older version. The firmware is no longer included in the uploader app and has to be downloaded separately. And there has to be a file manager installed on the phone. 1. 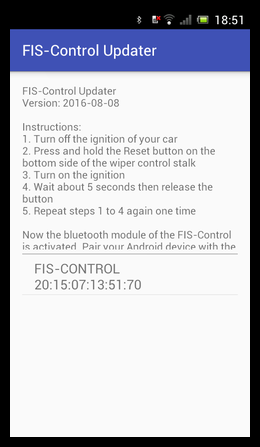 Set the FIS-Control into update mode (press and hold the reset button on the bottom side of the wiper stalk and turn on the ignition, wait for a few seconds, then turn off and on the ignition one more time, release the button). 3. Launch the updater app and choose Connect either in the menu at the upper right or by pressing the menu button. Now choose the FIS-Control. 4. Click on "Upload file" in the menu and select a file manager on your phone to pick the firmware file. 5. Wait about 2 minutes until the upload is finished (you will see some "133" message in the meanwhile). Es gibt eine neue Android App. Voraussetzung ist ein Android ab 4.4. Die Firmware für das FIS-Control ist nicht mehr in der App enthalten und muss separat runtergeladen werden. Über die App können nun aber auch die Startlogos und die Konfig-Dateien an das FIS-Control gesendet werden. There is a new Android app. Required is Android 4.4 or newer. 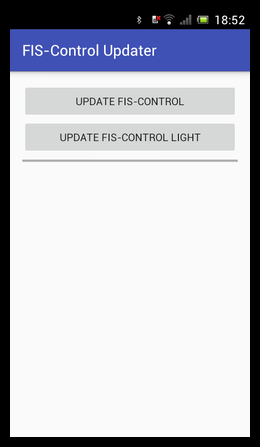 The FIS-Control firmware is no longer included in the app and has to be downloaded separately. 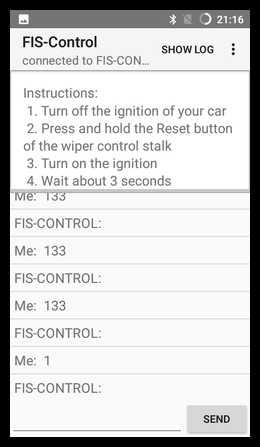 It is now possible to also send the startlogos and the config files to the FIS-Control with the app. Die App funktioniert jetzt auch mit Android 8 und Android 9. The app now also works with Android 8 and Android 9.